American Express Membership Rewards have long been one of the most valuable transferable points currencies. There are tons of ways to earn Membership Rewards points through your credit card purchases. Thanks to 16 airline and 3 hotel transfer partners, you’ll also have plenty of ways to redeem Membership Rewards for some amazing flights that can take you just about anywhere you want to go. 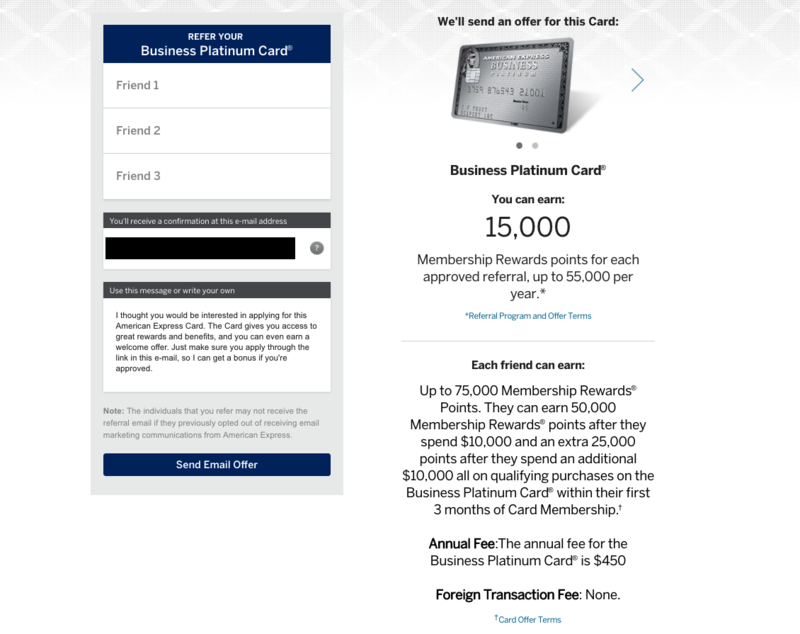 What Is American Express Membership Rewards? What Are Membership Rewards Points Worth? Amex Membership Rewards is a credit card rewards program that lets cardholders earn points on almost all purchases. To earn Membership Rewards, you must hold one of the many affiliated American Express cards. By holding one of these cards, you are automatically enrolled in the program. The number of points you will earn per dollar depends on which card you use and the category of your purchases as some are included in bonus categories. Bonus categories can help you earn between 2X and 5X points per dollar on some purchases. There are many ways to redeem Membership Rewards points, but transferring your points to airline partners to book award flights is how you will get the most value out of your points. Earning rewards points can be done in a variety of ways. However, to begin earning points at all, you will need to have at least one American Express Rewards credit card. The Platinum Card® from American Express is the classic Amex rewards card. It comes with a variety of benefits including Priority Pass lounge access, Delta Sky Club (when flying Delta), Hilton and Marriott Gold status, and more. Additionally, this card earns 5X points per dollar on flights purchased directly with airlines. Flight and eligible hotels purchased through AmexTravel also earn 5X points per dollar. It earns 1X points per dollar on all other purchases. You’ll also receive an annual airline fee credit of $200 and a monthly $15 ($35 in December) Uber credits. Hot Tip: You can only earn a welcome bonus once in a lifetime on each American Express card, so it’s best to wait until you can find a great offer before you apply. While it’s not common, it’s still possible to find a 100,000 point bonus on the Platinum Card®. The American Express® Gold Card has been given a major upgrade for travelers and foodies. It earns 4X points per dollar at U.S. restaurants and 4X points per dollar at up to $25,000 annual spend at U.S. supermarkets (1X after $25,000). Plus, you will receive an annual $100 airline fee credit to offset expenses such as baggage fees, and a new $10 per calendar month credit for dining out or participating restaurants and ordering from participating takeout services. This card earns 2X points per dollar at US supermarkets on up to $6,000 in purchases each year. Every month in which you make 20 purchases with this card, you will receive a 20% bonus on the Membership Rewards points you earn. This is a very good card for those who aren’t necessarily interested in a premium-level card — check out these 30+ AmexEveryDay® Credit Card benefits. Very similar to The Amex EveryDay® Credit Card from American Express, this card earns 3X points per dollar at U.S. supermarkets on up to $6,000 in purchases per year. It also earns 2X points per dollar at US gas stations. Additionally, when you make 30 purchases in a month, you will receive a 50% bonus on the points you earned that month. This business card has very similar benefits to the personal version of the card. The lounge access and hotel status bumps are the same. However, it only earns 5X points per dollar on flights and eligible hotel purchases made through AmexTravel. 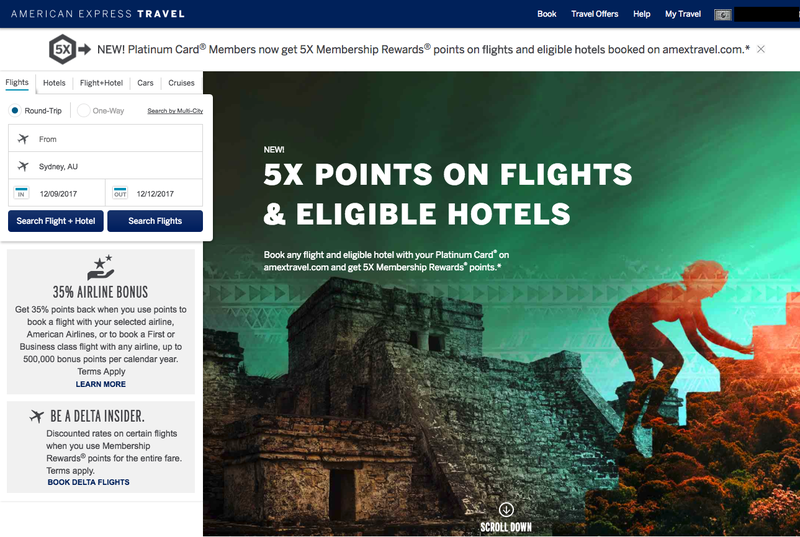 It does not earn 5X points per dollar on purchases directly with airlines. However, it does earn 1.5X points per dollar on purchases over $5,000, which can be very useful to business owners. Additionally, cardholders also receive 10 Gogo inflight internet passes per calendar year. It also comes with a $200 airline fee credit each year. This rewards card has 5 bonus categories to help you earn even more Membership Rewards points. You can select 1 of these categories to earn 3X points per dollar, and the remaining 4 will earn 2X points per dollar. These categories include flights purchased directly with airlines, purchases at U.S. gas stations, shipping costs, advertising in select media, and computer products from select providers. The first $100,000 spent in these categories per year will earn bonus points. Probably the best non-premium business card, this card earns 2X points per dollar on all purchases up to $50,000 in spending each calendar year. The OPEN Savings program permanently ended May 31, 2018. Any charges from June 1, 2018 will not earn OPEN Savings. Check Amex Offers for potential savings at former participating merchants. When you log into your account home page, you can scroll to the bottom of the page to find a section titled “Amex Offers & Benefits.” This replaced what used to be the American Express shopping mall (similar to the Chase Shopping Mall). Now, you can add offers from select merchants, and when you make purchases with that merchant you will earn whatever award is offered. These offers can be additional rewards points, cash-back, or a cash discount. There are often some great offers that include earning 2X points per dollar at Amazon, discounts on your cell phone or cable bills, and so forth. Amex also advertises their services in this area, and you can find referral links here. Note that to take advantage of the offer, you must use the specific card to which the offer is attached. You must add the Amex Offer to your card before making the purchase. You can find Amex Offers & Benefits at the bottom of your credit card account summary screen. Each card has different offers. The Amex travel portal allows you to book flights, hotels, cars, cruises, and vacation packages. You will earn 2X points per dollar with all your Amex cards. All American Express Membership Rewards cards will earn 2X points per dollar when booking through the Amex Travel portal. Unfortunately, even if you are using a card that earns 3X points for flights, you will still only earn 2X points in the portal. That’s because Amex requires you to purchase travel directly through the airline in order to get the higher bonus. However, The Platinum Card® from American Express and The Business Platinum Card® from American Express will earn 5X points per dollar when booking flights and select hotels through AmexTravel, including prepaid Fine Hotels and Resorts booked online. In their portal, you will find deals exclusively for Amex cardholders that are only available online. Additionally, you can still earn frequent flyer miles when booking through the portal, which is a bonus. Not everything in the portal will be eligible for 2X points per dollar: exceptions include car rentals, non-prepaid hotels, and non-prepaid Fine Hotels and Resorts bookings or those made over the phone. However, the 2X points per dollar may be a better value than your hotel points, and you may get a cheaper room. If you find a better deal somewhere else for the same room and dates, the portal offers a low price guarantee for its prepaid hotel rooms so you can get a refund for the difference. One last thing to note is that booking through the rewards portal will cost you a service fee. Depending on the deal and how you value your points, this may not be worth it for you. You’ll pay $6.99 for a domestic plane ticket and $10.99 for an international one, but hotel bookings are free. Remember also that folks who have The Platinum Card® from American Express get these service fees waived. One cool thing about the travel portal is that it will show you what benefits you have when you log in, including waived fees and which lounges you have access to with your cards. Bottom Line: The travel portal is a good way to earn extra Membership Rewards points. However, make sure you are getting the best deal for you and note any restrictions. 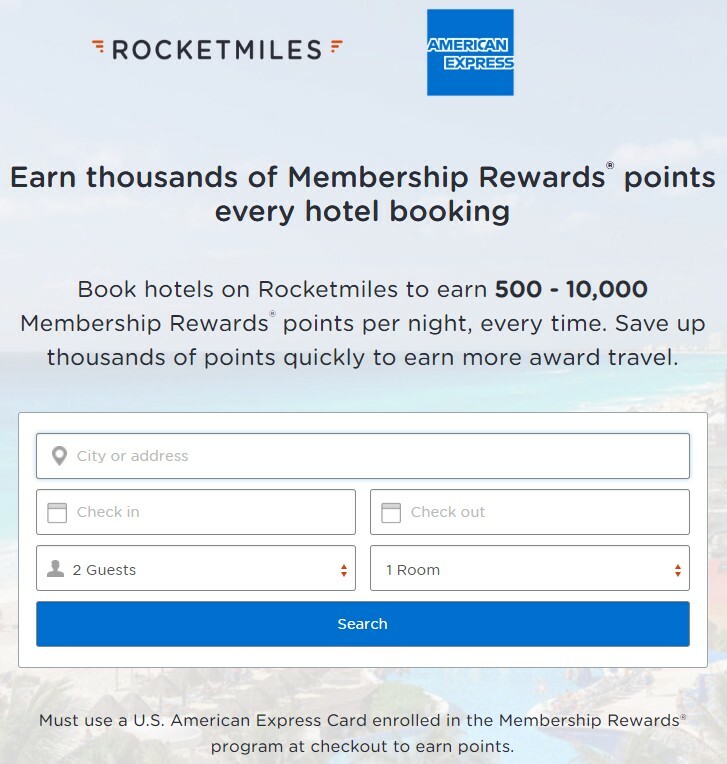 American Express and Rocketmiles have kicked off their partnership where you can earn 500-10,000 Membership Rewards points per hotel stay. Shop around to compare the Rocketmiles rate with other rates available. Note that stays booked with RocketMiles typically do not earn hotel program points and you may not be eligible for hotel program benefits such as room upgrades. Some hotels honor status benefits even when they do not need to. 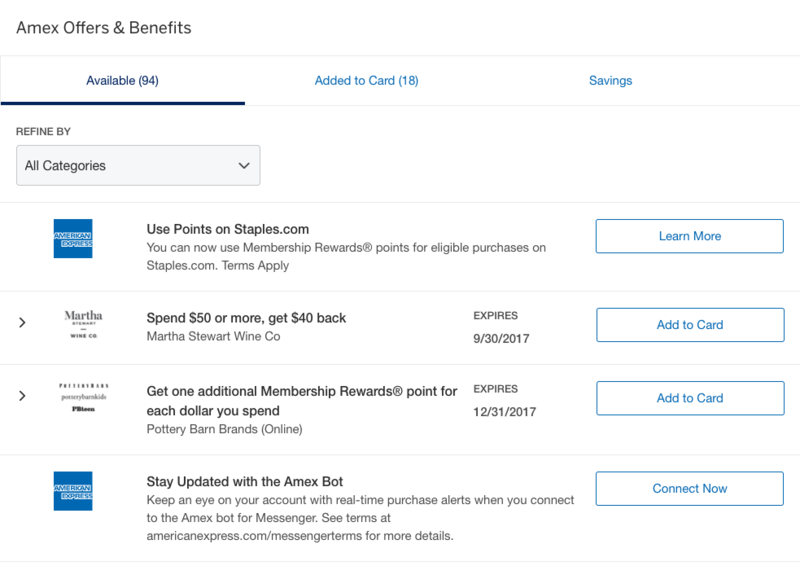 The referral links can be found at the bottom of each of your account summary screens in the “Amex Offers & Benefits” section. Click on the “Refer Now” button, and you’ll be taken to another screen where you can enter multiple emails and choose which card you want to refer. Friend referral links are in the “Amex Offers and Benefits” section or just below your account summary. That screen will tell you what your current referral offer is (often 5,000-10,000 points, or $50-$100 for cash-back cards). It will also tell you the offer your friend can get, so they can compare that to any offers they already have. Once you open the referral section, you will be able to choose which card you want to refer, and it will display the current bonus for you and your referral. Note that American Express seems to have some trouble with these referral links, and they may not always work once the person receives the email. Many cards have specific benefits, such as travel credits, Boingo Wi-Fi, and complimentary elite status. Your American Express account makes it easy to review and activate these benefits right from your account summary screen. The Benefits screen displays all the benefits of your card and has links for further details. Go to the menu bar and click “Membership” and select “Benefits” from the drop-down menu to see a benefits summary screen. From this screen, you can review everything your card offers and find links to sign up for all applicable benefits. Clicking the “Membership” button in the menu will you to all of your benefits. Alternatively, you can get to these benefits screens via the “Amex Offers & Benefits” list at the bottom of each cards account page. Membership Rewards can be redeemed a number of ways but travel is where you’ll get the most value for your hard-earned points. Specifically, transferring to airline partners is your best option. This is almost always the highest-value option, as you can typically multiply the value of your points many times over using transfer partners. Most Membership Rewards cards that you can get will allow you to transfer points to travel partners. These cards also happen to be some of the most lucrative cards you can get. However, there are some cards that do not allow transfers. Amex isn’t accepting applications for many of these cards, so you shouldn’t worry about it too much. The Terms and Conditions that state which cards do or don’t have the ability to transfer points to Amex travel partners have been made more clear, but unfortunately still are not for all cards. The “Some” means that it depends on each individual account; some might have it and some might not. This will be determined by the benefits listed on your application. As we’ve already mentioned, transferring to airline partners is the best way to use your Membership Rewards points. To transfer Membership Rewards points, you’ll only need to follow a few simple steps. Select “Transfer Points” on the Membership Rewards page and you’ll be taken to a page with all of your transfer options. Select your desired transfer partner and you will be taken to a page where you can choose how many points to transfer. Most transfer options require you to transfer blocks of 1,000 points. Many of these transfers take place almost instantly, but others can take several days. If it is your first time transferring to a partner, you will be required to link your airline or hotel loyalty program accounts prior to the transfer. To do this, you will need the appropriate loyalty program membership number. Once a transfer has been completed, it cannot be undone. Another thing to note on transferring points: for every point you transfer to a domestic carrier, you will pay a $0.0006 fee, up to a maximum fee of $99 (equal to 165,000 points). Unfortunately, this is a slight hit to the value of the points. American Express allows you to offset the fee with points, but this is a terrible value at only $0.005 per point. Thanks to the three major airline alliances (Oneworld, SkyTeam, and Star Alliance), your Membership Rewards can get you just about anywhere you want to go. Membership Rewards can also be transferred to hotel partners, though this should only be done if absolutely necessary as they are more valuable when transferred to airlines. Etihad is not a member of any of the three major alliances but it has built a large network of partners which means you have a lot of interesting ways to redeem Etihad Guest miles. Finally, you can transfer your points to three hotel partners but you’d get more value sticking to airline partners. All Membership Rewards cards are allowed to book Amex rewards travel using points. When booking with points, you’ll get $0.01 per point for flights, and $0.007 for everything else. Booking a hotel through the Amex Travel Rewards Portal. 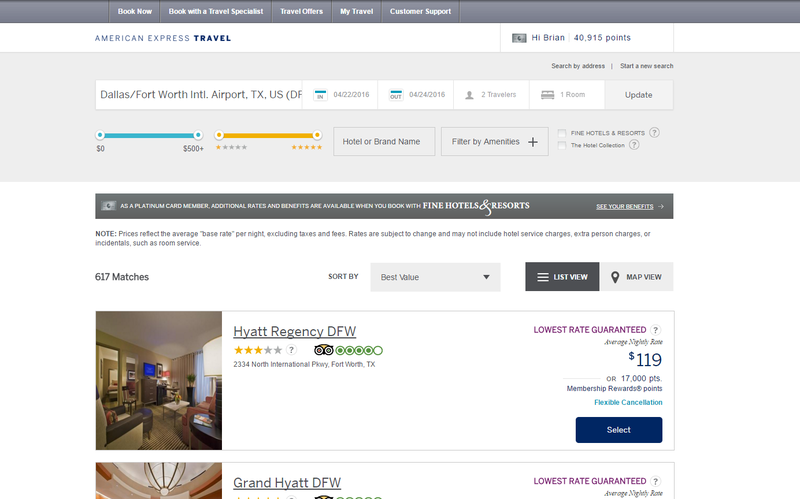 Points for hotels are worth $0.007 and flights are worth $0.01. 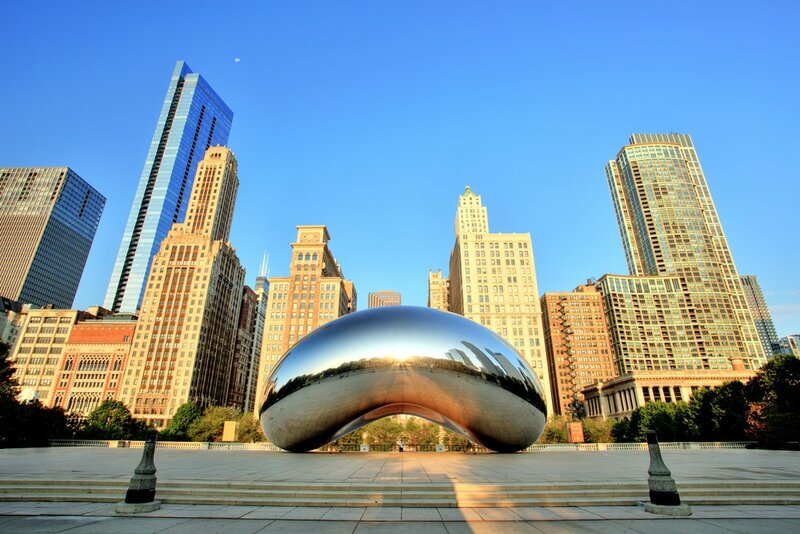 Note that booking rewards travel with points will still incur the service fee if you don’t have The Platinum Card® from American Express, which allows these fees to be waived. There are a number of other ways to redeem Membership Rewards points but all of them are subpar. You can use your points to pay off statement balances directly. Unlike most other points programs, however, points are not worth $0.01. Instead, using this feature only provides a value of $0.006 per point. You can use your points to pay off charges on your statement. These come in at $0.006 per point. If you’re going to use points for gift cards, the value of your points will be between $0.005 and $0.01 per point, depending on the gift card you choose. You can find a variety of gift cards in Amex Rewards. Buying them with points brings a value of $0.005 to $0.01 per point. There are also vouchers available for other businesses, but these values change depending on the choice of the partner. For instance, you could buy a one-day ski pass at Vail for 15,900 points, which isn’t that great of a value. Pay with Points options show up under the “More Ways to Use Points” menu. Values range from $0.005 to $0.007 per point. These options are found in the Membership Rewards portal when you click the “More Ways to Use Points” button at the top. Amazon is a big partner of Amex right now, and you can pay for purchases directly with Amex Membership Rewards points. However, the points will only be worth $0.007 each. Similarly, you can use your points at Best Buy right now to receive the same value. Another service is American Express tickets. Partners include Ticketmaster, Telecharge.com, and AXS (another ticket purchasing portal). All these options are worth $0.005 per point. You can also use the American Express shopping mall to redeem your points. Points in this mall are only worth $0.005, although you can mix and match paying with points and cash. Points are typically worth $0.005 each when you shop in the Amex Rewards Shopping Mall. This is a great option for those with some extra points. You can donate to many different charities at a value of $0.01 per point for the first 500,000 points in a year. The minimum donation is 1,000 points. If you have extra points, you can always donate them to charity for a good cause. You’ll get $0.01 per point for this. You can utilize any points you can’t use elsewhere on a number of shopping networks. This includes using Pay with Points (merchants such as Amazon and Ticketmaster) and the Membership Rewards Shop. There are many more options, but we won’t cover them all here. In general, your reward points will be worth $0.01 or less utilizing these methods of redemption. The Plenti program ended on July 10, 2018. American Express gives you many different options to use your points, so it can be confusing as to what the points are really worth. There are always options for redeeming at the standard value of $0.01 per point. These include booking flights, and gift cards. Other redemption options, however, come in at a much lower value. If you take advantage of the points transfer to Amex travel partners, you can increase the value of your points to $0.02 or more (this depends on how you redeem them through the airlines or hotels). As long as you have at least one active Amex Rewards card open, your points don’t expire. 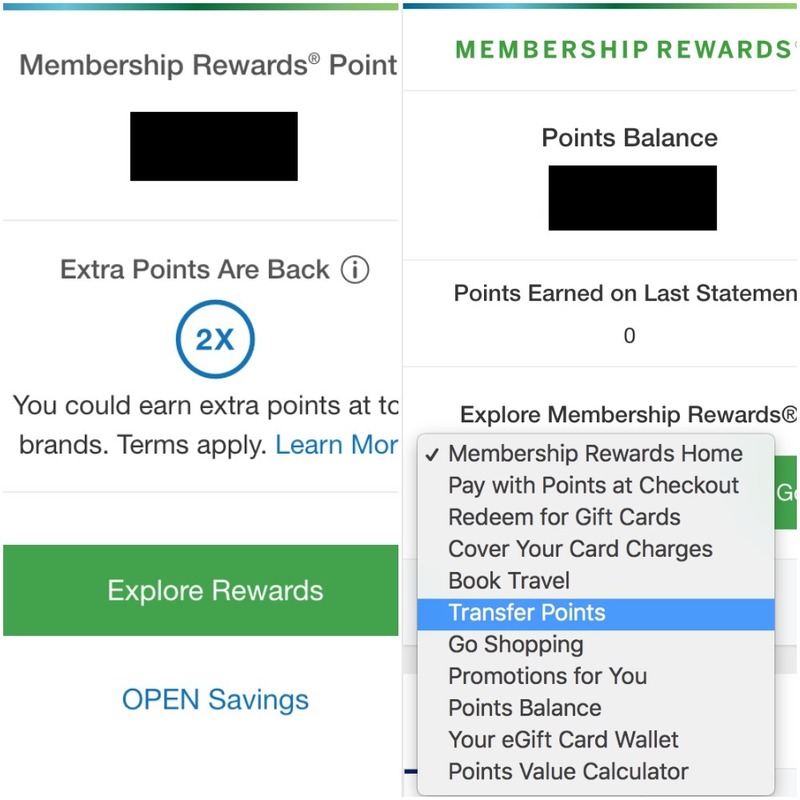 Since Membership Rewards points pool into a common account instead of on individual cards, you won’t lose any points on a certain card if you don’t transfer them (like you would with Chase Ultimate Rewards). If you decide to close your accounts, make sure to transfer your points to an Amex travel partner first. You may have a 30-day grace period once you close your accounts, but you will require at least one other open Amex card. There is the possibility that you can reinstate your points if you lose them, and you could work with American Express customer service to determine whether this is possible. 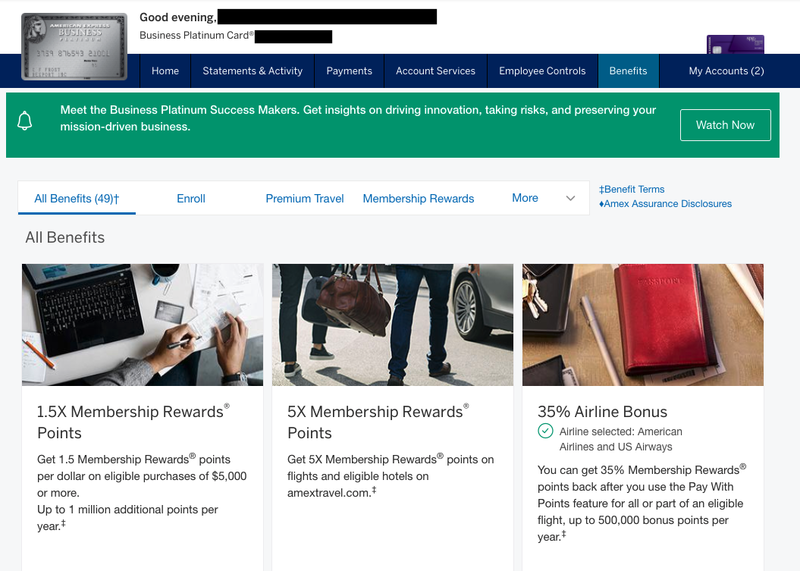 Now that we’ve discussed how to earn and redeem Membership Rewards points, let’s make sure you know how to navigate the American Express website. To manage our account, simply sign in with your Amex login info. Log into your American Express account to get started. From there, you can select the Explore Rewards link to take you to the Membership Rewards page. This page will show you how many points you have in your account and you can select how you would like to use them. Select Transfer Points if you want to transfer Membership Rewards points to an airline partner. From here, you can select “Transfer Points” to be taken to your airline partner options. In addition, the way this system is setup, you won’t have to worry about switching between cards to take advantage of benefits that you get from one versus another. For instance, having The Platinum Card® from American Express allows you to waive Amex Travel booking fees, and that will automatically be detected in your account. To change between cards on the Amex account home screen, you can click in the upper right-hand corner or in the menu at the top left. To switch between cards, simply click their picture at the top right of the screen, or you can click on “My Cards” to bring up a list of cards. The last thing to note is that if you are viewing a card that only earns cash-back, the screen will look a bit different, and you’ll have to navigate to Membership Rewards via the menu. Cash-back cards have a slightly different layout since they don’t earn Amex Rewards points. You can still view information and summaries about your cash-back, however. You can bet some amazing value out of Membership Rewards points, but how do they stack up compared to other transferable points programs? Both programs feature lucrative credit card options. There are more Amex card options (12+) that can help you earn Membership Rewards while Chase only provides 6 cards that earn Ultimate Rewards. Membership Rewards also has more transfer partners with 20 while Ultimate Rewards has 11. However, Chase’s transfer partner World of Hyatt is by far the best hotel partner between the two programs. In the end, starting with Ultimate Rewards is the way to go because of the 5/24 rule. However, Membership Rewards should be a big part of your points-earning strategy going forward. The big advantages to Membership Rewards are that there are plenty of credit card options and the cards offered have some great bonus categories. The advantages to earning Marriott Bonvoy points are the 40+ airline transfer partners and that transfers of 60,000-points blocks earn you a bonus 5,000 miles. However, transferring Marriott Bonvoy points can take longer and there are only 2 cards that can help you earn them. Marriott points can also be used for hotel stays at Marriott properties. Each program provides some great award travel opportunities and can both be very useful in your earning strategy. The Citi ThankYou Points program isn’t as well-known as the others, but you can redeem ThankYou Points for some great award flights. There are 14 airline transfer partners and 1 hotel partner. It does not have a domestic transfer partner but the transfer partners do provide some interesting options. It can definitely be a useful program down the road, but Membership Rewards are a higher priority. 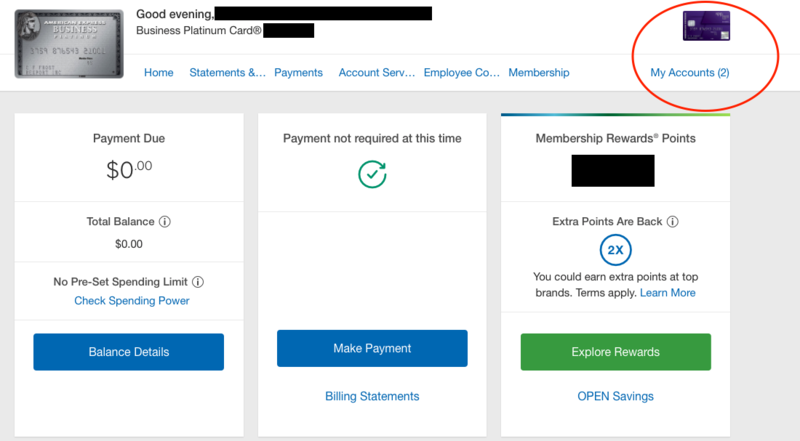 As you can see, the Amex Membership Rewards program is fairly extensive, with lots of cards and many options for earning points. Your card options include some that are good for both business and personal use. 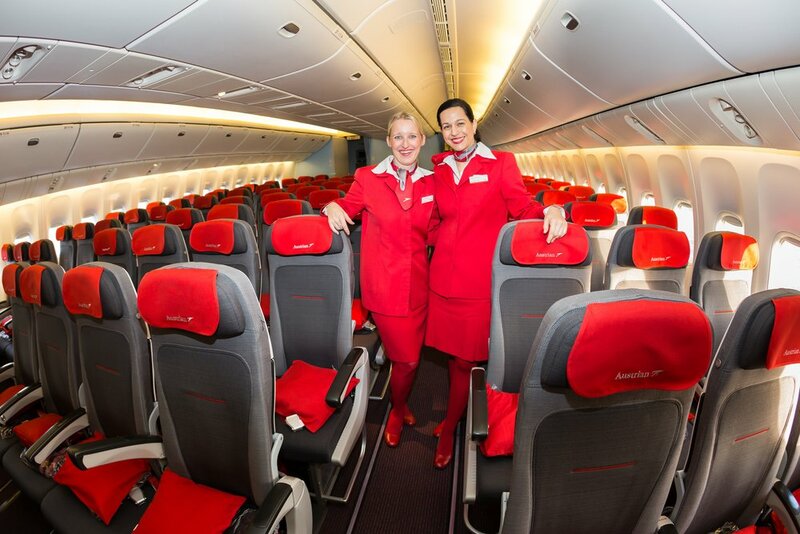 There are plenty of redemption of options, although only transferring to airline partners really provides good value. Note that American Express has a restriction that only allows you to earn one welcome bonus per card per lifetime, so make sure you apply when a card has a higher bonus. Overall, you should use American Express Membership Rewards if you are planning to transfer points to travel partners, and redeem them at a value above $0.02 per point. Otherwise, Chase Ultimate Rewards or Marriott may be an easier and more valuable choice. American Express Membership Rewards is the points loyalty and awards program provided by Amex for a number of its credit cards. When you apply for one of these cards, you will be able to earn and redeem points. You have nine different options for rewards categories, as well as many different choices in each category. Use points for travel rewards to get the most value. There are 12 different cards that earn Membership Rewards points. Each has their own set of perks, and some even have bonus categories to earn 2-3x points instead of the standard 1x points on most cards. How much are Membership Rewards points worth? Membership Rewards points are worth anywhere from $0.005 to over $0.02 each, depending on the rewards choices you make. Your highest value rewards will be transferring points to travel partners. How do you use Membership Rewards? Membership Rewards is automatically enrolled on all the eligible cards, so as soon as you are approved and begin using the cards, you will begin earning points. 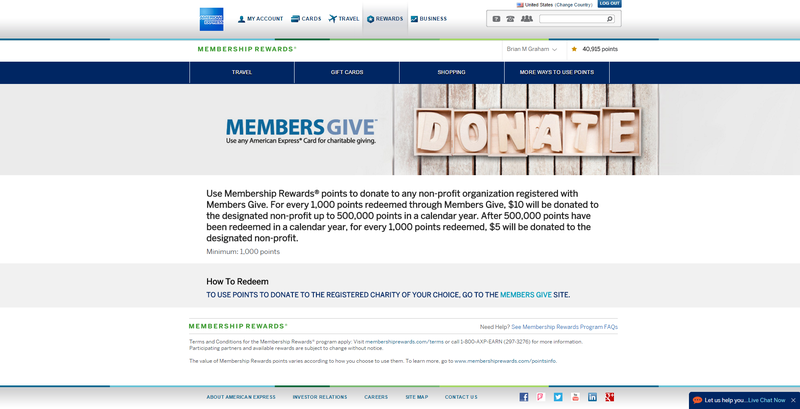 At any time, you can go into the Membership Rewards portal to view your account summaries and the various ways to earn and redeem points. Once you have enough points, you can start making redemptions. How do you earn Membership Rewards points? Points can be earned in a variety of ways. A great way to earn points is through introductory bonuses. You always earn 1x points minimum on purchases, but some bonus categories earn 2-3x points. 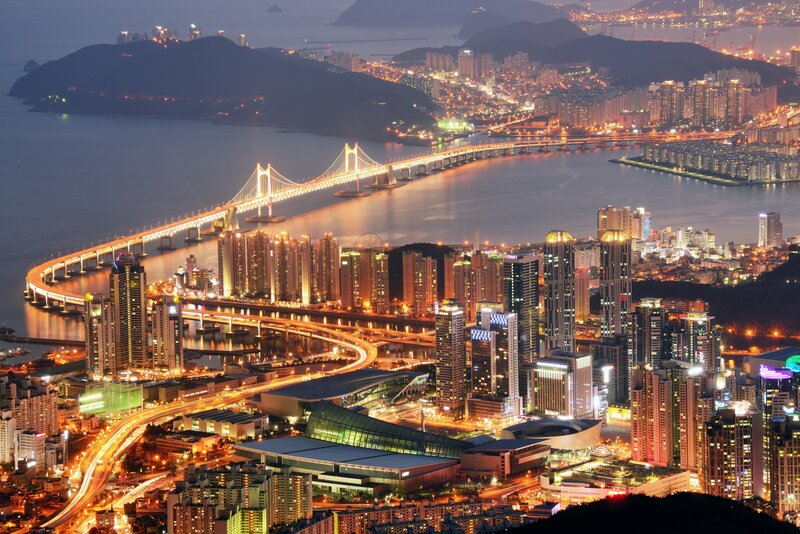 These include supermarkets, restaurants, flights, hotels, and more. Additional bonus points can be earned when you get American Express offers, which are available to you when you log in to your Amex account. How do you use Membership Rewards points? Membership Rewards points can be used in nine different options, each of which has multiple choices within that category of redemption. In general, you can use it to pay for a variety of different merchandise options, gift cards, charity donations, and business partners such as Amazon. You can also use it to pay for trips booked in the Amex Travel portal. The highest value method of using points is to transfer them to the American Express travel partners, which include a number of different airlines and hotels. What is the Membership Rewards phone number? You can call Membership Rewards at +1-800-297-3276. You can also use the American Express phone number on the back of each of your cards, or find more online. What is the American Express login? You can log into your Amex credit card and all other portals through the AmericanExpress.com login. How do i book Airbnb with amex points? When will the Membership Rewards Home Depot gift cards go on sale? From what I can tell, May-June is the time frame when MRs sells Home Depot gift cards.